All of our 43cm satellite dishes are fitted with Quad LNB’s as standard. 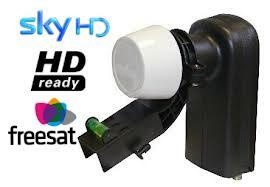 They are ideal for both Sky and Freesat installations. The Quad LNB allows up to 4 seperate satellite feeds to be taken from just 1 dish, which makes it ideal for home distribution. All satellite installations are fitted with the latest twin cable as standard, which makes it suitable for recording programmes (Sky+ and all Freesat recordable PVR’s). We specialise in fault finding, servicing and repairing existing satellite problems.